Never cry over first drafts! 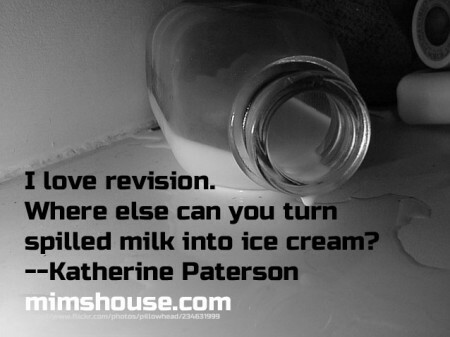 Instead, take heart in Katherine Paterson’s wise words: Make ice cream. Once again, I am writing a really, really bad first draft. I know that I can clean it up. But every time I do this, I am slightly embarrassed. Really? That’s the best I can do? I have avoided the draft of the last two chapters of this story for over a month, but finally, deadlines loomed and I had to buckle down and do this. I tried my best to write two good chapter. Instead, they are very bad. That’s why I put it off. But putting it off doesn’t change the reality. Sometimes, no matter how you try, you must just write the draft, even if it’s bad. Then, you can revise and refine ad nauseam. But you can’t revise what isn’t written. It’s a cold reality. I should have embraced the bad. Just done it a long time ago. The writing process is crazy. But it works. Bad first draft is done today! Now, for the joy of revising. Great reminder! I wrote a horrendous first draft of my first novel and for a moment I was crushed, and then I laughed at myself at the absurdity of thinking a first draft can be anything but. Congratulations on finishing your first draft! That’s an accomplishment. I guess all writers feel the same about wanting “so badly to write well,” but you’re right it’s part of the process. I take comfort in knowing that all writers have to go through the process. Although we are alone behind computer screens, we’re all in it together. Yes, first drafts are awful. But I WANT them to be good! We are all in the same boat! The writing process works, but it’s not always a comfortable process. When I feel down about my first drafts, I refer to the excellent and succinct quote by Hemingway about first drafts. It is worth Googling. I have seen the Hemingway quotes about drafting. For me, it’s hard to revise that first draft even after my critique buddies lovingly suggest it needs work. It felt so right as I wrote it. How could it not be? Eventually, I do develop something better, thanks to critiques and my love of the writing journey. Yeah, I know what you mean. When I finish a draft, I am brilliant! Of course, the next day eality dawns!